Like the money managers in 2000 who either closed up shop or joined the New Economy—I'd better either jump on the real estate bandwagon, or stop barking at the tires. Predictably, I'll put a stake in the ground and say what so many others have been preaching for so long: the housing cycle is over. There are worrisome signs that soaring energy prices are beginning to spill over to the rest of the economy. This last month after 3 major hurricanes, surging fuel prices pushed inflation up by the most in 25 years. 2-year Treasury yields, more sensitive to expectations for monetary policy, reached four-year highs after streaking past 4.3% this week. Mortgage giant Freddie Mac reported today that the nationwide average for 30-year, fixed-rate mortgages rose this week to 6.15 percent, up from 6.10 percent last week and the highest level since 30-year mortgages were at 6.21 percent in late July 2004. The housing market cannot continue dodging these natural market forces forever. Although we have witnessed tremendous appreciation during the last few years, rising inflation and soaring energy prices were not a concern as they are today. Homebuilders must now manage around unprecedented raw material price increases that will filter directly down to the consumer. If the housing market turns south, where is the economic damage likely to be the greatest? Surprisingly, the greatest economic impact may not come where prices slide the most. Instead, the regions that see the most pain will be those where homebuilding has been a major source of new jobs. A decline in housing could accelerate job losses in the entire local economy. The most vulnerable spots according to a new analysis by BusinessWeek, include the Riverside-San Bernardino region, San Diego, Phoenix, Las Vegas, Tampa-St. Petersburg and greater Baltimore. In each of these areas, new jobs in construction accounted for over 20% of total payroll growth in the past year versus a national average of 10%. Surprisingly, some of the areas that have seen the biggest runup in housing prices aren't overly vulnerable to a homebuilding slide. 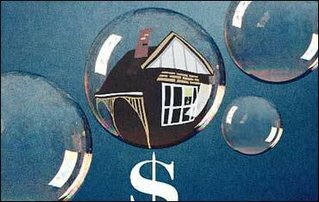 Those planning on residing in the same dwelling for many years can continue to sleep well at night knowing that they will be sheltered from a potential bubble. But everyone else, especially those in the higher-risk areas, should be very careful entering the market in the near future.